Valerie Ghent makes you want to mooove. Heads bob, shoulders shimmy, feet tap. At the end, there’s irrepressible dancing in the aisles. Having spent years with Ashford and Simpson on keyboard and as a back‐up singer, the vocalist/musician/songwriter is breaking out, defining her own dynamic territory. Ghent is a really interesting combination of sincere, blues tradition, funky interpretation, and deadpan sophistication of which even Dorothy Parker would approve. Appearing draped against the wall in darkest shades, leather, and uber‐high platform boots, Ghent takes the stage simmering. I got dis‐trac‐ted she sings—distracted by a man, of course. It’s a simple, repetitive lyric with palpitating backbeat and everything left to the imagination. 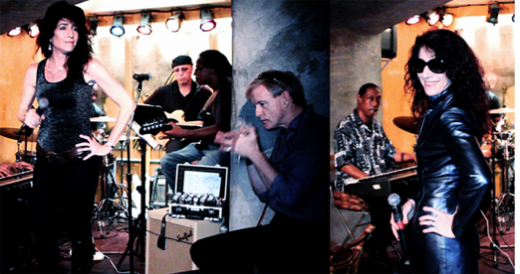 Close your eyes and hear the accompaniment of an 80 year‐old, black, Delta bluesman. Open them to see the astonishing Dennis Moriarty who is none of the aforementioned. The musician plays as muscular and blistering a harmonica as I’ve ever heard. “Wash My Dishes,” also by Ghent, continues palpable insinuation wrapped in mid range resonance. Innocent on the written page, lyrics elicit “Oh yeahs!” from the audience. Her response is immediate and flirty. “Who washes the dishes in your house? !” she demands in the face of several fans. Ghent sashays, yelps, growls, and dances. She’s even got a signature dip. Lines like I want to marry your hands echo. Going “back into the archives,” reaps Georgia White’s “Hot Nuts” and “Blues Ain’t Nothin,” as well as “Feel Alright This Mornin” popularized by Big Mama Thorton. White’s list of reasons to be low include being in love with a married man, a good man stuck in jail, and an empty bank account. Some things never change. Ghent sings from the guts. Her contralto rises with the smooth momentum of something out of NASA. Numbers from the artist’s CD: Day to Day Dream, which I highly recommend for good time listening, include the title song and “Wheels On A Train.” In the first, stop/start phrasing keeps the sway going with sustained notes. “I never said it’d be eezA,” she warns. The arc goes from churning to calm to driving. Riffs are varied. Everyone will get this message. Wheels is offered as “a little cool down” and, in fact, feels like a ride. Ghent plays fine, gritty keyboard on both. CD and artist info at Day to Dream. 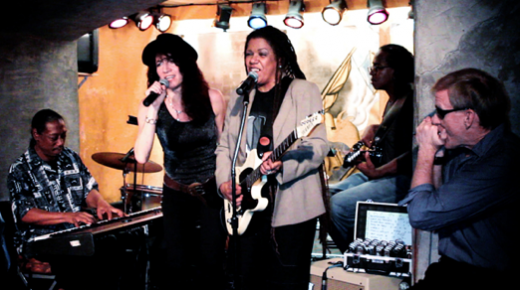 Special Guest Felicia Collins (from The David Letterman Show) is featured on guitar and vocals with Muddy Water’s “Can’t Lose What You Ain’t Never Had.” Lyrics seem squeezed out of Ghent creating raw edges. When Collins lets loose the two women are ferocious. (Clearly Collins is worthy of her own evening.) Add one hard driving harmonica and whip for sounds of lament that could rock a gospel choir. As Collins leaves the stage, she nods to Dennis Moriarty “You are SO serious! I can’t get enough of you.” Mutual admiration adds vigor and spice. Valerie Simpson calls Ghent “powerful and soulful.” I’ll say. In spades. Photos by Fredy Mfuko for Mission 101 Media. 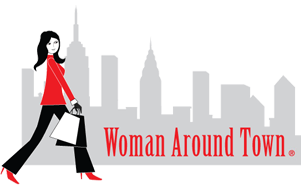 TWO MORE SHOWS: September 18 & 25 at 8 p.m.
From Woman About Town, by Alix Cohen – read original HERE.